BALTIMORE, MARYLAND – We spent the weekend as a seeing eye human. Our daughter asked us to dog-sit. What are parents for? And the dog in question, a golden retriever, had gone blind. Ol’ Billy would take a little extra care, she told us. And so, we took Billy down to the farm and soon learned the extent of his infirmity. Eager to join your author on his round of duties, he took off at a run to follow him down to the barn… and ran right into a tractor. Billy was blinder than we thought. But we soon got used to helping him navigate, by keeping him close and grabbing his collar in tight situations. Billy ran into trees and bushes, stumbled over steps and stools… and got lost. But we admired his character. He never seemed depressed. He never blamed anyone else or pitied himself. He had the noble trait of being able to endure hardship without bending to it. He just cheerfully went on being a blind dog, like Argos… waiting for Odysseus’ return. Trump Ends “Drug War” – Unleashing $22 Billion Bonanza? You’ll soon see a whole new line of these products flooding into almost every home in America. If you thought PCs and smartphones were big, you haven’t seen anything yet! While we kept one eye on Billy, we turned the other to money. The most interesting development in the money world is the rise of outrageous and preposterous public policies. Donald Trump is probably largely responsible. 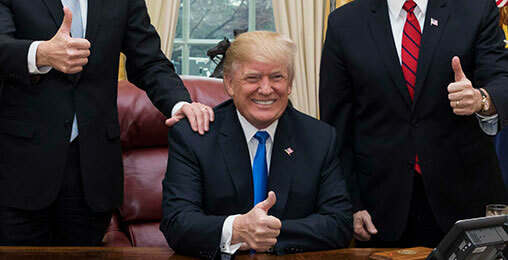 With his late-cycle tax cut… his “trade wars” with Canada, Europe, and the Chinese… and his $1.2 trillion deficit – he showed that anything is possible, no matter how lame-brained it is. And now, the lame brains from the other side of the aisle are getting in the act. Like new varieties of the flu, bad ideas are spreading fast. We mentioned last week that MMT (Modern Monetary Theory) was achieving broad acceptance in some intellectual circles. Broadly, MMT states that debt and deficits really don’t matter. A government able to print the money that is owed can never willingly go broke. Forgiving student debt is probably the first item on the agenda, followed by free tuition, free medical care, and a guaranteed income. Along with these budget-busters is coming a new attitude towards the rich, too. In a word, rich people will no longer be seen as role models and inspirations… they’ll soon be pariahs. In this space, we – and practically we alone – have complained about the rich, too. And we explained why: They got their money unfairly, about $30 trillion of it… thanks to the fake money system. And now, without understanding the crime… the mob is getting ready to hand down a verdict. And carry out the sentence. It’s heating up the tar and collecting feathers; soon, it will pick up its torches and march to the best zip codes. I’m talking about a sea change bigger than anything we’ve seen in America in the 231 years since the Constitution was written. And for vast segments of the population, it could turn into a daily nightmare. 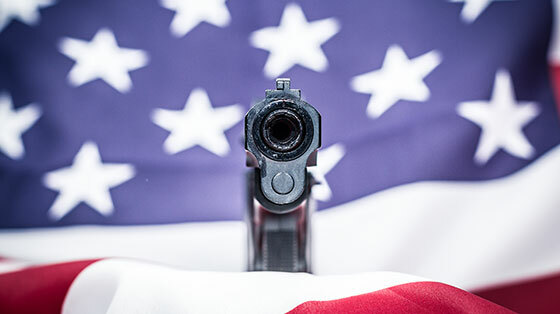 What am I talking about, and how can you protect yourself? Today, we turn to China. Stocks rocketed up at the end of the week. The proximate cause of Friday’s jubilation was a rumor… that the Chinese had proposed a solution to the “trade war.” That is, they proposed to buy more of our stuff. By increasing goods imports from the U.S. by a combined value of more than $1 trillion over that period, China would seek to reduce its trade surplus – which last year stood at $323 billion – to zero by 2024, one of the people said. The officials asked not to be named as the discussions aren’t public. But there’s more to the China story than just trade. Let’s face it. 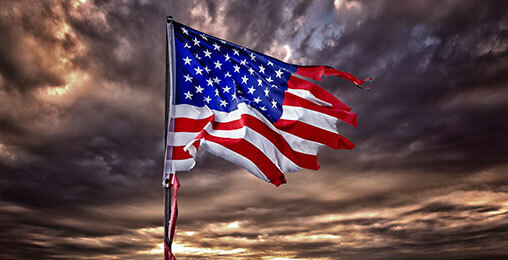 China and the United States are now not just rivals, but regional and global adversaries. The United States is trying to push or at least keep China down economically, technologically, and militarily. China is determined to continue to rise. Whenever you see “we need to” in newspaper opinion, you can be sure that what follows is idiotic. 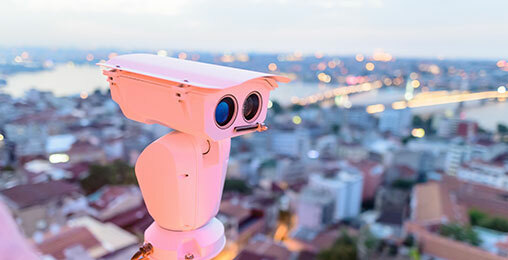 A controversial new technology is expected to hit every neighborhood in America – even YOURS. It’s already being reported on in The New York Times, The Wall Street Journal, and The Washington Post. Find out what it could mean for you and your wealth. Untying the U.S. economy from China is not possible. The relationship is sick… but symbiotic. The U.S. provides the fake money. China provides the cheap stuff. Now, the whole world economy relies on both of them. And thanks to the tie that binds the two economies – dumbbell policies on both sides of the Pacific – both are in trouble. In both countries, the federales have meddled, distorted, and corrupted their economies. In the U.S., fake money lent at fake rates not only made the rich richer, it made the whole economy so fragile and vulnerable that it cannot survive in a normal market world. And the Chinese economy – guided by the geniuses at the Communist Party headquarters – invested trillions of dollars over-building capacity in almost all sectors. Steel, concrete, gidgets, and gadgets… now, it has to unload the stuff somewhere. Which is why it needs to keep the sales channels open… even at the cost of a humiliating concession to the American president. And in both countries, huge piles of debt threaten to avalanche down. Last week, it looked like China might be the first to be buried. Economic growth in the third quarter sank to 6.5 percent, the slowest pace since the depths of the global financial crisis in 2009. Car purchases fell last year for the first time in more than two decades. Apple Inc.’s warning in early January that iPhone sales in China were sagging alerted the world to how a slowing Middle Kingdom would drag down global growth and corporate profits. But the locals figured that out a while ago. Even after a recent uptick, the stock market in Shanghai has still plunged by more than a quarter from its 2018 high. We take no joy or comfort in China’s troubles. Whither China goest, we go too. P.S. Being a seeing eye human is not easy. Ol’ Billy couldn’t see, but he could smell. Out on the farm, he would get on a scent… and just keep going. We didn’t want to report to our daughter that we had lost her dog, so several times, we had to look high and low to find him. At the end of the weekend, though, we had become fast friends. Last night, we sat in front of the fire. Billy came over and rested his head on our knee. We didn’t want to take him back. That’s the story of today’s chart, which comes from the Institute for Supply Management (ISM). The ISM is a not-for-profit supply management organization composed of 300 manufacturing firms. By aggregating information from its pool of member firms, the ISM produces monthly data that gives us a big-picture view of America’s manufacturing sector. Today’s chart maps the ISM Manufacturing New Orders Index from January 2016 through December 2018. As you can see, the ISM’s New Orders Index rose sharply from August 2016 through December 2017. But the index has fallen 24% since then, hitting a 28-month low to close out 2018. That tells us that demand for manufactured goods is falling fast… Which also suggests that the economy is slowing down. 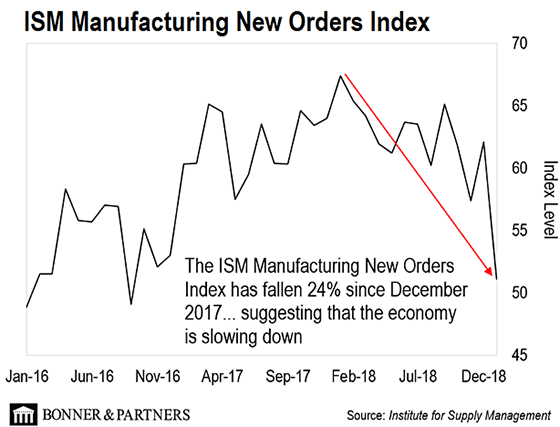 As we showed in this space last week, institutional investors are most worried about the economic cycle turning from recovery to recession in 2019… And this sharp fall in manufacturing demand is one reason why. Stocks continued their sharp snap-back rally last week, but our message remains the same: The market is not out of the woods yet. With more than 200 million tax returns expected to flow through its doors this year, the Internal Revenue Service is swimming through a river of data. How best to manage it? That’s where Silicon Valley comes in. Bill sees a market selloff coming. Stocks will crash. The economy will slide into recession. But there’s also a bull case to be made. One expert believes a little-seen market force could push stocks higher. Bill, you and Sean Hannity are both worried about how AOC will pay for the food, medicine, and education she proposes. Do you get this worried about tax cuts for the rich? How about over expenditures for war? Cuts in food stamps? Microsoft answered both your prayers.They just offered to pay $500 million for affordable housing around Seattle. Warren Buffett, Ted Turner, Marc Andreessen, and many other CEOs of conscience are also publicly giving their extra money away. Others should try it. It seems to feel pretty good to these guys. And it’s one of the great solutions to housing shortages, hunger, poverty, and mass inequality in our country. You just need two things: cash and a conscience. She doesn’t have a clue as to what works! She cannot understand the entire picture! Freebies? There are no freebies. Someone has to pay, and that again is the middle class. Meanwhile, a dear reader wonders out loud. The Chinese had a wall. Why not America? Hey Bill, I really appreciate your views which go back to ancient wisdoms… all too easy to forget in the noisy hubbub of the virtual world. But as for the wall…The Romans had one in Britain, the Chinese had one… why not the Americans? Won’t do the least good, of course… except to the cement industry. By the way, as you know well but many of your readers don’t seem to… the real job under-cutters don’t live as illegals in America, they live as citizens in places like China or Taiwan or Malaysia. Those jobs were outsourced there by good ol’ American companies working to the good ol’ capitalist mantra: Cut the labor costs and ramp up the profits. First, they came for the industrial workers by destroying the unions, which was their only real power. Now, they are coming for the middle classes who fondly imagined they were safe… well, think again. As Bill has been showing you, politicians like Alexandria Ocasio-Cortez have been advocating for something called “Modern Monetary Theory.” MMT promises free school… debt forgiveness… and a guaranteed income. But there’s a darker side to MMT: The shuttering of the American middle class, and the death of financial liberty. Full story here.